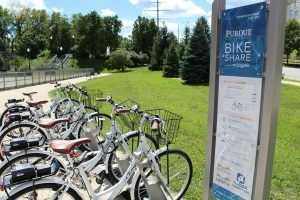 In August of 2015 Purdue launched a Zagster bike share program on its West Lafayette campus with funding from the Alcoa Foundation. Soon after, the cities of Lafayette and West Lafayette approached Purdue about expanding the program off campus. Both cities shared Purdue’s goal of offering a sustainable, healthy, and affordable alternative transportation option. In August 2016 Purdue doubled its program on campus and through a partnership with Lafayette and West Lafayette, added six off campus sites. With this expansion, Lafayette and West Lafayette each installed three bike share stations introducing a combined total of 30 Zagster bicycles into Greater Lafayette. You can find more information here on the Zagster website or with this handout from Purdue University. When the Lafayette Police Department recovers an abandoned bicycle, the bicycle is stored for at least 90 days (usually they are stored for almost one (1) year). Bicycles that appears to be worthy of resale are sold to an online police auction company. Registration: Bicycles can be registered through the Police Department at the Records Division window during normal business hours. There is no charge to register bicycles. To Report a Stolen Bicycle: Call the Lafayette Police Department at 807-1200. Surplus Bicycles: Since recovered bicycles are considered either property or evidence, they are not routinely auctioned. Registration: City residents are required to register their bicycles with the Police Department, per City Ordinance #46.02. The cost is $1.00. Bicycles can be registered during normal business hours at the Records Division window. The registration remains active until the department is notified that the bicycle has been sold or disposed. To Report a Stolen Bicycle: Call the West Lafayette Police Department at 775-5200. Registration: To register your bicycle, an online registration form is available at http://www.purdue.edu/bikes/riding/index.html.